Steep, high, and exposed, the Hobbit Book has the feeling of a remote alpine climb, despite being only a mile from the road. An exposed 4th class traverse above a sweeping 500-foot wall brings you to the start of the route, making the Hobbit Book a totally different experience from a typical day in Tuolumne. 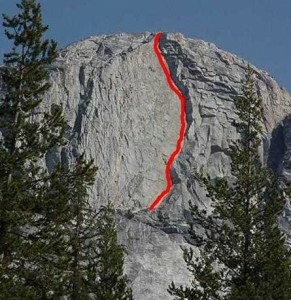 Add the major runouts on a steep, reachy face pitch, the time-consuming approach hike and roped 4th class traverse, and the Hobbit Book adds up to a day far more comparable to the Regular Route of Fairview Dome than to West Crack or other shorter multi-pitch climbs. Which SuperTopo guidebooks include a topo for Hobbit Book?